All over the world people are ‘coming up latent’ – developing new and terrifying abilities. Untrained and panicked, they are summoning storms, raising the dead, and setting everything they touch ablaze. US Army Lieutenant Oscar Britton has always done his duty, even when it means working alongside the feared Supernatural Operations Corps, hunting down and taking out those with newfound magical talents. But when he manifests a rare, startling power of his own and finds himself a marked man, all bets are off. On the run from his former colleagues, Britton is driven into an underground shadow world, where he is about to learn that magic has changed all the rules he’s ever known . . . and that his life isn’t the only thing he’s fighting for. Okay, so: I quite liked the film Black Hawk Down; I’m a fan of the X-Men franchise; I really enjoyed the film Avatar; and I used to love the TV show Heroes. 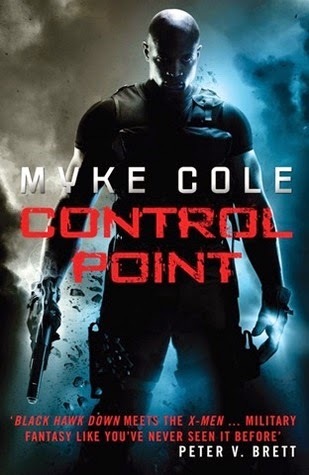 Therefore it’s not that surprising that I enjoyed Myke Cole’s Control Point, since it’s sort of a mixture of all of the above. ‘Why not’, indeed. Book one of Cole’s Shadow Ops series turned out to be a really enjoyable read, and despite a few misgivings early on (such as the improbability of the protagonist mastering his ability so quickly) and a couple of ongoing gripes (such as the almost schizophrenic back-and-forth of the protagonist’s attitude) I had a lot of fun with it. The premise isn’t all that original: a minority of people find themselves in possession of rare and magical abilities, which makes them outcasts. However, the book is set on an army base, and focuses on how magic can be integrated into combat, which is interesting; and I really liked the way we were shown various uses for the different sorts of magic, particularly Britton’s ability. The fact that the author was in the army himself really comes across here, and he creates a very authentic-feeling semi-fictional military setting. The characters do occasionally feel a little flat; one of the weakest points of the novel, for me, was the way Britton’s internal conflict was presented, namely the way in which his opinions are presented as a constant back and forth rather than as a gradual change. However, the pacing is great, and there’s a tonne of action and excitement, as well as plenty of awesome abilities and mythical beasties and gory scenes. The magical battles are vivid and pacy, and overall the book is a fun and enjoyable read. With the second book in the Powder Mage trilogy, The Crimson Campaign, recently being released I felt it was time for a re-read of the first book. 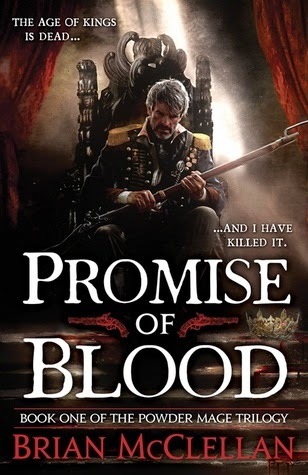 Promise of Blood captured my attention the first time I read it largely due to how different it is: this was the first time I’d read any so-called ‘flintlock fantasy’ and I thought it was great. I’m glad to say it stood up very well to a re-read, and if anything I enjoyed it even more the second time round. As I said, it’s different to a lot of fantasy on the shelves these days, particularly with regards to the setting. Instead of medieval Europe or thinly-disguised Asia, we have something more reminiscent of the turbulent social and political situation of France in the late 18th century. Rather than swords and sorcery, McClellan gives us intrigue and gunpowder; instead of kings and holy warriors, he gives us military leaders and corrupt priests; and, in refreshing turnaround of fantasy stereotypes both old and new, the characters he has created are human, likeable and believable. There are no all-powerful perfect heroes here, but neither are there any unsympathetic, grimdark anti-heroes; the author maintains a fine balance between his characters’ strengths and flaws, and for me it’s this that makes the novel so much fun to read. Another of the novel’s strengths is how the magic system is so integral to the story. Generally speaking there are three main classes of magic in McClellan’s world, the most powerful being the Privileged sorcerers, who are able to access and wield destructive elemental forces, and whose Cabals have reinforced the monarchy for hundreds of years. Then there are the Knacked, regular people possessing relatively minor abilities such as never needing to sleep, or being able to discern truth from lies. Finally, and most interestingly, there are the fighting men known as Powder Mages, who have the ability to telekinetically control bullets, mentally ignite gunpowder from long distances, and actually imbibe gunpowder to augment their own strength. I have no doubt that the story would have been interesting even without the presence of any sort of magic system; but the magic, and the conflict created by it, is as much a part of McClellan’s world as the political and social turmoil, and adds an extra dimension to the upheaval caused by Tamas’ rise to power. The main plot is woven through three major storylines: each focuses on a different character, and each is more or less equally captivating. Field Marshal Tamas is fighting to retain control of his country in the aftermath of his bloody coup against the monarchy; retired police inspector-turned-private investigator Adamat is charged by Tamas with uncovering the traitor in his ranks whilst also delving into long-forgotten lore in pursuit of a dark mystery that threatens the world; and Taniel Two-shot is sent on an unpleasant mission by his father which brings him into conflict with forces far greater than he can manage alone. The story more or less revolves around these three characters, but there is still plenty of room for other, more minor, characters, all of whom are delightful: my particular favourites are Tamas’ irreverent bodyguard Olem, the mysteriously powerful chef Mihali, and Taniel’s enigmatic mute sidekick Ka-poel. The only storyline I didn’t really engage with was that of Nila, the laundress, but I suspect she will become more important in future events. Promise of Blood has made the shortlist for this year’s David Gemmell Morningstar Award for best debut novel, and with good reason. It already has my vote! Left for dead - her kin have fled and her country is overrun with enemies - Cywen fights to survive. But any chance of escape is futile once Nathair and his disquieting advisor Calidus realize who she is. They have no intention of letting such a prize slip from their grasp. For she may be their one chance at killing the biggest threat to their power. Meanwhile, the young warrior Corban flees from his conquered homeland with his exiled companions, heading for the only place that may offer them sanctuary. But to get there they must travel through Cambren, avoiding warbands, giants and the vicious wolven of the mountains. And all the while Corban struggles to become the man that everyone believes him to be - the Bright Star and saviour of the Banished Lands. Book two of The Faithful and the Fallen picks up almost exactly where book one left off, which was a little bit disorienting for me as it’s been a few months since I read Malice. However, everything started to come back to me after a few pages, and I was surprised at how much I remembered. 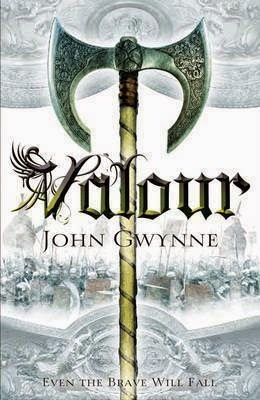 Valour begins in the aftermath of huge events, and this instantly gives the book a slightly different atmosphere. As with Malice, I really enjoyed the parts of the story that were set in the Celtic-influenced areas. The settings are beautiful and vivid, and the forests and mountains and castles distinctly brought to my mind the time I’ve spent in Wales and Scotland. However, a large part of the story also takes place in a Spartacus-like setting, which provides a nice sense of variation between chapters. One of my main criticisms of the first book was the use of named POV chapters as popularised by GRRM. While the author does still use this format, he keeps it interesting by introducing several new and varied POV characters, and also by varying the length of the chapters, some of which are only a few pages long. The new POV character additions also help to address the imbalance of male and female characters, which is always a good thing. It was nice to see the characters from Malice grow and develop, particularly the younger ones, who were essentially children in the previous book; and the growing focus on characters who were barely even mentioned in the first book of The Faithful and the Fallen really begins to hint at the grand scale the series is intending to achieve. For seventy years they'd guarded the British Empire. Oblivion and Fogg, inseparable at first, bound together by a shared fate. Until a night in Berlin, in the aftermath of the Second World War, and a secret that tore them apart. 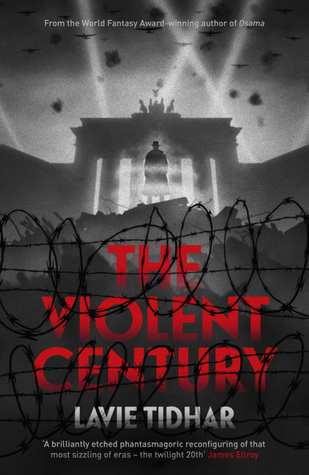 The Violent Century is unlike anything I’ve ever read. A tale of conflict, espionage and superheroes set mainly during the various conflicts of the 20th century, it is most often compared to Alan Moore’s Watchmen. Suffused with the moody intrigue of a John le Carre novel and written in a postmodern style similar to Cormac McCarthy’s The Road, Lavie Tidhar’s standalone novel explores the hypothetical role of superheroes in historical conflicts, focusing in particular on World War II. The majority of the plot takes place at different points in the past, and is framed by a narrative involving the interrogation of one of the central characters. Tidhar’s superheroes, or ‘Ubermenschen’, are an exaggerated and deliberately stereotyped representation of the role and ideologies of their respective countries in each of the conflicts. From Britain there’s Oblivion and Fogg, shadowy and furtive and seemingly innocuous; from the USA there’s Tigerman and Green Gunman, ludicrously costumed and arrogant; from the USSR there’s the Red Sickle, from Transylvania there’s Bloodsucker and Drakul . . . you get the picture. These characters, along with the author’s masterful use of setting and atmosphere, really create a distinctive feel of each historical era, from post-war Berlin to the Eastern Front, the Afghan desert to WWII Transylvania. The Violent Century is definitely not for everyone. The style can be a little off-putting at first sight, and the time jumps are occasionally disorienting and disruptive; but the concept, and the atmosphere, kept me sufficiently immersed, and I even found that, once accustomed to it, the style actually makes for very fluent reading. My only criticism would be that I didn’t really feel there was enough exploration of Fogg’s motivations, and so the final payoff wasn’t quite as emotionally charged as I imagine it was intended to be. However, overall, the positives far outweigh the negatives. The tone is cynical yet wry, the underlying message - that the world would have turned out in exactly the same way even if superheroes did exist - is depressing yet oddly reassuring, and the finale is sad yet cathartic, and incredibly hopeful. All in all, a memorable story that will probably stay with me for quite some time. Definitely worth a read. Lavie Tidhar is the World Fantasy Award winning author of Osama, of The Bookman Histories trilogy and many other works. He also won the British Fantasy Award for Best Novella, for Gorel & The Pot-Bellied God, and was nominated variously for BSFA, Campbell, Kitschies, Sturgeon and Sidewise awards. He grew up on a kibbutz in Israel and in South Africa and currently resides in London. Lavie can be found online at http://lavietidhar.wordpress.com or on Twitter @lavietidhar.